Step 1 Use the largest coldcut (probably the honey ham) for the outside layer. Step 2 Overlap that coldcut about 1.5 inches, making 2 rows of 4. Make sure it’s overlapping, then layer your other meats on top. Step 3 Squeeze on the mustard and mayo, but only on one half. This will be the half that is going to be the inside or middle of your roll. Step 4 Layer your thinly sliced tomato, the banana peppers and spinach (and any other toppings you choose) over the mayo/mustard. Step 6 Roll from the filling side first as tight as you can. Step 7 Wrap in parchment or wax paper, like a burrito, and off you go. *Capicola ham is similar to proscuitto, however capicola is meat from the shoulder of the piggy and proscuitto is meat from the thigh. Boar’s Head sells it as “cappy ham” and it’s usually located around the salami and mortadella. 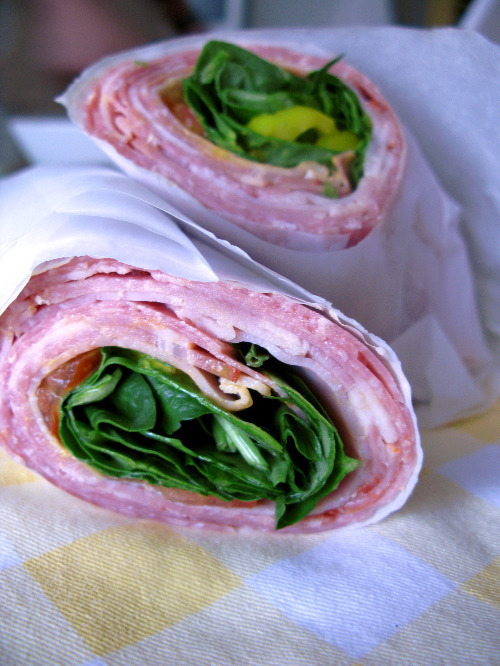 We wanted to call this, Paleo Italian Sub Mariner–the Rolex of Paleo subs. But alas, often times we think we’re very funny when others do not. Most Paleo, low-carb sandwiches use the lettuce as the “bread”–that makes no sense since lettuce breaks and tears so easily. So–why not use the meat, the most flexible component of a sandwich as the “bread” and put the lettuce and all the other goodies in the middle? Booyah! Roll these bad boys up in some wax or parchment paper and you’ve got a portable lunch.